CATS started in 1974, building Shell and Tube Heat Exchangers for the Chemical, Petro-Chemical, and Power Generation Industry. Today, we are known globally for a wide range of equipment found in the Energy, Chemical, Pharmaceutical, Food and Beverage, and Pulp and Paper Industries. CATS has built long term, professional relationships with many clients, earned by its commitment to provide a comprehensive service that meets high quality standards. All aspects of CATS design engineering and manufacturing are customized to suit individual specifications and comply with recognized codes and standards. The company has an extensive track record which illustrates its versatility in handling large and small projects, and a diversity of engineering and fabrication services. Top notch quality, consistent upgradation of the products and passion to innovate the latest solutions is the hallmark of every esteemed engineering concern. These factors are the trademark at CATS india. 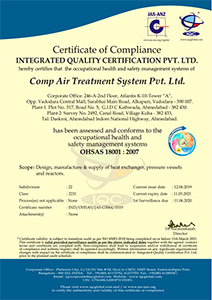 The ISO 9001:2000 certified unit is a progressive manufacturer and exporter of highly efficient and durable Compressors, Heat Exchangers, Chiller Condensers, Non-return Valves and many other allied products. All our products are known for their superb performance in the entire business community. We are a regular member of Benchmark 7QC and National Accreditation Board for Certification Bodies (NABCB), the constituent of Quality Council of India (QCI). The company is professionally managed by a group of highly experienced professionals having decades of experience in their respective trades. Testing facilities are backed up with a full fledged laboratory to conduct various tests. Our export markets are centered in UAE, European and Asian countries. CATS objective is to provide competitive, quality fabricated equipment while maintaining a favorable environment for our employees. Efficient operations and innovative problem solving will allow us to remain profitable and earn recognition. We follow stringent quality control measures at every level of our organization to ensure flawless production. Every step is monitored by a group of qualified inspectors who are equipped and trained enough to foil every attempt on quality front. We source the finest quality of copper SS/ MS tubes/plates & rods, and other forged material from reputed agents of the market to ensure premium quality. Proper tagging enables the inspectors to co-relate the finished product, with raw material utilized and the history of material can be ascertained at any stage. All the products are manufactured as per internationally accepted norms and standards to quench the desirable quality thirst of the client. Timely delivery of products, providing us an additional edge in the market.